Alhamdulillah always a reminder for myself ana abduka ajiz, wa daif, wa miskeen, wa zalim, wa jahl but for the Grace of Allah I am still in existence. We try to take a path of nothingness. As much as this dunya wants to make us something, our duty and responsibility is to negate the self. Alhamdulillah that Allah guided us to Islam, Alhamdulillah Allah ‘s huge and immense ni’mat is that Allah guided us not only to Islam but to the houses of reality, the houses of muhabbat, the houses of zikrullah. It is an immense immense reward, immense gift from Allah ‘s Divinely Presence. That from the Oceans of Light in the World of Light their teachings are immense, powerful Oceans of Realities that as much as you enter into that reality it keeps expanding. Ramadan is a month which we have been waiting eight months to reach to this point. And all their teachings was the teaching of the love of Sayyidina muhammad ﷺ. That Allah wants us to understand that Holy Qur’an is alive. 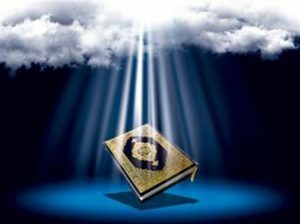 Allah (AJ) wants us to understand, holy Quran is not even created, but it is an ever, an eternal flowing Ocean of Realities. It is the source of all power, the source of all Qudrah, the source of everything that is coming into existence in creation, its power is from Holy Qur’an. Glory to Him who draws near to His Power and Immortality/eternity. That these are the nights and the days of Allah’s Qudra and power, which is what? Holy Qur’an: “Qaf wal Qur’an al majid.” (Quran 50:1). The Qudrah (power) of Allah (AJ), these are emanations. The source of all power is Holy Qur’an, like a waterfall. It is coming and every manifestation is coming from it. So Qudrah قدرة is Qur’an قرآن. Allah ‘s Power, when He wants to release power upon Creation is the Holy Qur’an. Where is Holy Quran Emanating from? 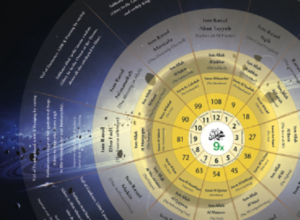 Then they begin to teach all these 8 months and 8 years and 10 years and 20 years of teaching was that: where is that Holy Qur’an emanating from? When we are all sitting and trying to read Holy Qur’an we are not asking, and we shouldn’t be asking, not only the physical pages ya Rabbi that I am reading, but ya Rabbi dress me and bless me from the Lights and realities of Holy Qur’an. Those physical pages are a means in which the Light enters into the heart. It’s not the goal that you only looked at the paper, but there are angels attached to each huroof. 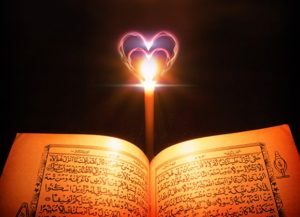 They are lights attached to Allah (AJ) ‘s Divinely Words, Uncreated Words that are manifesting in the heart of Prophet ﷺ, which is again beyond understanding. That Allah (AJ)’s Creation called Muhammadun Rasulullah ﷺ , and Allah ’s Uncreated Words flowing from. This is the reality of Qaba Qawsayni aw Adna. 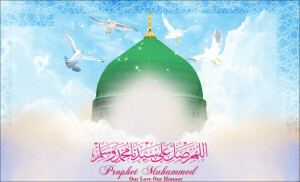 How Prophet ﷺ can move and appear near the presence of the Divinely Presence? That same reality Allah has that wherever Prophet ﷺ is moving, whether through physicality or whether through the Light of Sayyidina Muhammad ﷺ, Allah (AJ)’s Uncreated Words; Allah ‘s Azimat, Allah ‘s Qudrat is flowing from the soul of Prophet ﷺ. Means that ati ullah is Allah ‘s Holy Qur’an, ati ar Rasul means it is the Lights of Holy Qur’an that are manifesting through the heart of Prophet ﷺ. Wa ulil amri minkum, they carry that reality and reflect that reality upon Creation. Where Allah (AJ) says: I am going to love you and I am going to forgive all your sins. Allah ‘s Love is what? To give you an accounting degree? To give you cash in your bank? Allah ‘s Love is Holy Qur’an. If you follow Sayyidina Muhammad ﷺ, later you will be taught, but you follow, you love, you make durood shareef. You keep the example of the Exemplar of Faith, that is the one whom Allah loves. He is the example of kindness, of Rahma and Mercy. You busy your tongue with durood shareef and salawat upon Sayyidina Muhammad ﷺ. Some people, their mind is not understanding this reality, they say, “No make zikr of Allah , there is no need for drrood shareef.” No, you are incorrect. Zikr of Allah (AJ), Allah won’t even listen to you if you are not praising upon Sayyidina Muhammad ﷺ. The belief of Shaitan was he wanted nobody but Rahman. He didn’t want to follow Adam (as), he didn’t want to bow down to Sayyidina Adam (as), he wanted nothing. He said, “between me and Allah, nothing.” Allah says: you are incorrect, between you and Me is Adam (as). You are not that one who you think you are, I want ihtiram (respect) and humility, bow down. Shaitan said: “No, I am not bowing down.” That belief is not our belief. Our belief is to understand Prophet ﷺ is carrying that Light. That the Lights of Holy Qur’an are emanating from the heart of Prophet ﷺ. So they teach you from the World of Light that, “Busy yourself with durood shareef and salawats opon Prophet ﷺ, you are drawing closer to Holy Qur’an.” Every time you make durood shareef upon Sayyidina Muhammad ﷺ, ‘Allahumma salli ala Sayyidina Muhammad wa ala aali Sayyidina Muhammad ﷺ , the Light of Prophet ﷺ comes back to dress us with ten Salawat. Those 10 salawats are filled with the lights Holy Qur’an. What are they filled with? Means all the Lights of Holy Qur’an begin to dress us and bless us. 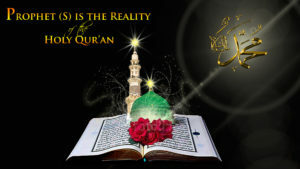 And that is why Allah is teaching: ati ullah the highest obedience and conveyance to Allah is to obey His Holy Qur’an. 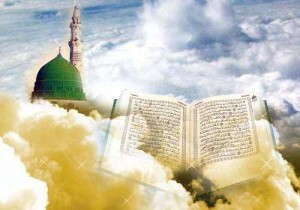 And Allah(AJ) is knowing you can’t obey My Holy Qur’an to the extent I want you to, so ati ar Rasul, so follow Prophet ﷺ. If you love and follow Prophet ﷺ he dresses you. ‘Wa ulil amri minkum’ that their responsibility to bring everyone to the love of Prophet ﷺ. By loving Sayyidina Muhammad ﷺ we are now being dressed by Holy Qur’an. 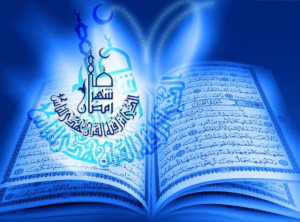 This is the month of Ramadan, the month of ‘tanzilal quran’. When this emanation is continuously flowing, where is it flowing from? Means Ahl al Marifa (People of Gnostism) and the People of Haqaiq (realities), they are not just running in the rain of where it is from, they are going to the source of where it is coming. Its source is in the heart of Prophet ﷺ! The source of all these emanations is in the World of Light, known as “Qalb” قلب . That reality, as soon as we are making salawat, as soon as we make the mehfil, as soon as we are making the durood shareef, the souls are floating into that presence. Their worshipness is only for Allah (AJ), this is not worshipness. This is the realities of Malakot: one light with one light with one light equals one light because there is only singularity in Allah ‘s Divinely Presence. As these Lights are moving into that Ocean, praising upon Sayyidina Muhammad ﷺ Allah is dressing them from the Lights of Holy Qur’an. These are the realities of the holy month of Ramadan. We welcome the holy month of Ramadan, the month of fasting, the month of Qiyam al Layl (nightly devotion), praying at night our taraweeh and the nights of reciting holy Qur’an. 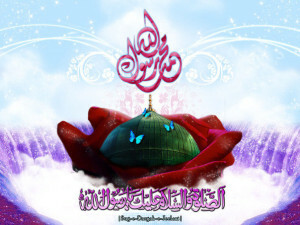 There are so many blessings, so many realities, so many Rahmas and mercies that Allah is dressing upon all of humanity. And we encourage everyone to experience that miracle. That it is not something only reserved for Muslims, its reserved for all of humanity. It is one of Allah ‘s greatest miracles. That you try to fast at any other time of the year, it is very difficult. But one of Allah ‘s greatest miracles is as soon as this gate, where Ramadan opens a Baab of Rahma, that the Oceans of Mercy, like water, spiritual Lights that begin to flow upon the Earth. That Rahma first ten days…Prophet ﷺ describes the first ten days of Ramadan is a Rahma because that Rahma you feel it, you are being dressed by it, that Rahma is a means in which to enter into the states of fasting. wa akhiruhu `itqun min an naar. That is one of Allah ‘s great miracles. That you enter into this month of what you think to be fearful. And this is a symbol of our life, we always see the fire of faith; every action based on Iman is like a fire. We say, “O this is going to be very difficult, this is going to be so hard. How can I cheat my way out of this? How can I sort of break and get away from this?” Because the ego, the nafs, and all the bad characteristics, they see this as a fire. What Allah wants us to understand, what Prophet ﷺ wants us to understand, what Mawlana Shaykh is teaching and has taught all our lives is that: what you deem to be a fire, is a fire of Rahma. That don’t be fearful of Allah ‘s Rahma and Mercy. What looks like a fire to your nafs and to your being, is a source of immense joy and power to your soul. That move towards that, don’t have fear of that, move into that Ocean of Ramadan. And we encourage many people who are not from the Muslim faith, that to fast the Ramadan. Attempt to feel the miracle of Allah (AJ), of God Almighty, that He gives such a tremendous support, that as soon as you enter that state you begin to lose that fear of fasting. And the fasting becomes so easy and so joyful and so pleasant. Ramadan is a time of immense contemplation, a time of immense generosity, a time of immense cleansing. That everything that we feel about ourself, that when you enter into that state of fasting, how much it is washing, how much it is cleansing, how much it is purifying. How much Ramadan opens compassion towards humanity. That ya Rabbi we live in a world where we have never experienced thirst, we have never experienced hunger, we don’t experience poverty and difficulty. As soon as you abstain and forbid yourself from what is allowed, you begin to feel that feeling: ya Rabbi astagfirullah there are people who are thirsty, let me to do something with my life to resolve their thirst. There are people who are hungry, ya Rabbi what can I do with my life to be of service to take away their hunger? There are people in difficulty, in calamity and in sufferings, that let me to live a life in which we are of service to humanity. So many realites open from holy Ramadan and from Mawlana Shaykh’s teaching, no matter what, no matter what, never run from Allah (AJ). If you don’t think that you can complete the Ramadan, and that you can’t fast the whole day, never walk from your amal (action), never walk away from Allah ‘s Rahma. If for some reason there is a medical condition or whatever your excuses are, do whatever you can, Mawlana Shaykh encourages Allah (AJ) is immensely merciful. Even if you can only do half a day, and then eat, and then enter back into your fasting. Whatever comes to your heart, never walk away. What Shaitan wants is, “O you can’t do it 100% correct, get out and leave your fasting.” That is incorrect, incorrect. Allah (AJ)’s Mercy is so immense, so unimaginable that never run from Allah , never drop anything that Allah wanted for us, He will bless it, He will forgive it. They say from the knowledge of Awliyaullah that even wherever we fall short, Allah sends an angel that: complete My servant’s worshipness, I feel shy to bring them up to Me where it was insufficient. That is His Mercy, His Love. That you are Ahl al Muhabbat and lovers of Sayyidina Muhammad ﷺ and for some reason, you have a medical reason, or you have something, they say, “O I can’t do it complete, I can’t do it all the way,” whatever you can, do. However you can do, Allah says: to the grain of a mustard seed We keep a hisab. So there is no way that if you trying with sincerity, that Allah will throw that amal away. He multiplies it, He blesses it, He sends an angel to perfect it. And we ask all of us to be encouraged to enter into that state, to be dressed by these Oceans of Annihilation, to be dressed by these Oceans of Rahma. May Allah give us the strength to complete to whatever degree we can complete this holy Ramadan. To fast its days, to pray it’s nights, to read the Holy Qur’an, to be dressed by the Lights of Holy Qur’an. Ya Rabbi increase us in the love of Sayyidina Muhammad ﷺ manzilal quran (house of Quran), the walking Qur’an, the walking Kitab. Ya Sayyidi, ya Rasul al Kareem, ya Habib al Azim, unzur halana wa ishfalana dress us from your Lights, bless us from your Lights, perfect us with your nazar. We make small steps towards your presence and that you dress us and bless us from your Lights, perfect our character. Everything that we are doing is by imitation and we put no value on that imitation. That every amal to be presented to Sayyidina Muhammad ﷺ and for Prophet ﷺ to be happy and to intercede for that amal and present it to Allah perfect and perfected. Subhana rabbika rabbil izzati amma yasifoon wa salamun alal mursalin wal hamdulillahi rabbil alamin. Bi hurmatil Muhammad al Mustafa wa bi sirri surat al Fatiha.